5.0.4 makes my blood boil! Okay… I hope you’ll pardon the pun in the title. I’m actually quite thrilled at the DK changes i’ve run across. Crazy amounts excited about the blood DK changes. I spent some time playing with it last night, and some little things REALLY caught my attention that just made me happy. A lot of them are tiny little quality of life issues, but still, some of them are just AWESOME. I went in and blew through Naxx 10 solo, just to get a feel for things. Initially, I was going to play around and test out the different rune regeneration talents (level 75 tier). The first one I went to check out was Blood Tap, and the first boss I went after was Patchwerk. I gotta be honest guys, after doing Patch with Blood Tap on, I was sold. I didn’t even WANT to try Runic Empowerment (because I already know how it feels, it’s what blood’s been using ever since release). Macroing Blood Tap into all of your main abilities really is the ONLY way to regenerate runes guys. It is so smooth and seemless…. it’s just awesome. Another thing that I hadn’t really paid attention to before, but made itself ABUNDANTLY clear when fighting Patchwerk… Crimson Scourge is now baseline for blood DKs. Previously it was a talent that we didn’t really pick up because… well blood boil was kinda worthless, even with that extra damage. Well, now I can freely admit that blood boil STILL doesn’t hit very hard, but now, they’ve made a pretty big changed to Scarlet Fever… For those of you playing along at home who AREN’T clicking on links… Blood Boil now refreshes diseases. Let me say that again, in case you just skimmed over it without paying much attention. Blood boil. Now. Refreshes. Diseases. Holy batshit you guys, that’s amazing. Not only does it solve the problem generated by moving Outbreak back to a 1 minute cooldown across the board, but when combined with the Scarlet Fever passive, it means that our diseases pretty much will NEVER fall off the target. Why’s that? Because you ALWAYS have blood runes to get rid of. The *easy* answer is that you can simply replace heart strike with blood boil, but that’s a relatively inelegant solution (although perfectly viable). Ideally, you’ll want to use heart strike as much as possible, only spending a rune on blood boil if your diseases are JUST about to fall off and you don’t have a proc. It is possible, but probably won’t happen that often. Generally, save runes for heart strike, and CS (Crimson Scourge) procs for blood boil. Now, a caveat to the above statement. Crimson Scourge *also* gives you a free death & decay. It doesn’t reset the cooldown on it, but it’s extra damage. This is one of those things that Blizz gives you a way to seperate yourself from the pack. It’s perfectly acceptable to do nothing but blood boil. Your diseases will guarantee to never fall off, and you’re only sacrificing a modest amount of DPS. But the DK tanks who can properly weave in heart strikes, and even Death and Decay (I confirmed that it DOES do more damage, even on a single target at zero vengeance, than blood boil) properly will squeeze out that extra bit of dps. With the way vengeance no longer has a cap, I suspsect that it’ll become more and more significant as the content you run becomes harder. Now… The other thing I noticed while playing, that I hadn’t noticed before, was the Scent of Blood change. Interestingly enough, this accrues with *every* auto-attack swing. This will be a little more curious to see how it plays out in the grand scheme of things, but I suspect that some of the absolute “Best of the Best” tanks will somehow find a way to time their death strikes properly after getting a couple stacks of this. Big damage incoming? Stave off the Death Strike for a bit and get a couple charges. Take the big hit, heal yourself back up massively, watch the healers go “wait what just happened?”, laugh yourself silly. Fun times for everybody! This ties in to my (ever ongoing) indecision on which class i’m going to play for Mists. I figure I will spend a week on each toon (druid and DK), exclusively. Raid tank with it, run 5-mans with it, the whole shebang. At the end of each week, I will post my overarching thoughts, and then I will compare the two. My comparison may go into another blogpost, it may not… I haven’t exactly decided yet. 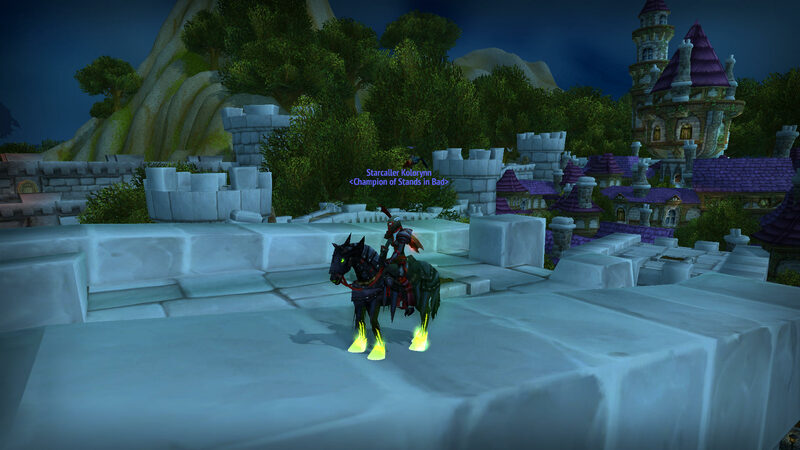 By the way… Pretty much ALL THE TIME, my DK will be on the Headless Horseman’s mount.